As pet owners, it’s always hard to see your dog in pain. But, it’s also helpful to know there are things you can do to help decrease your dog’s pain when it’s caused by arthritis and hip dysplasia. 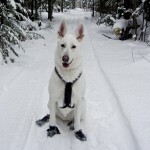 This documentary about a beautiful white shepherd named Malibu, also known to her friends as Boo, illustrates what her condition was before and after Vet-Stem cell therapy. You can see how her hip dysplasia set her up for a life of pain due to arthritis and how Vet-Stem has helped her live a happier life. The strong bond between Boo and her owners is evident, and now her quality of life has improved. To quote Boo’s owner, “technology saved the day!” And thanks to Dr Benjamin Ealing and the Broad Ripple Animal Clinic for recommending this amazing new treatment.